It was exciting being invited by Ellefluence to the exclusive Urban Decay launch of their limited edition, Jean Micheal Basquiat inspired makeup range. A huge thanks, to Laura for a fun night. As I get more into makeup, I'm becoming more intrigued with the Urban Decay's products and I already have a couple of favourite items. Simtuamilously, I want to focus on purchasing brands that are cruelty-free as I view animal testing unnecessary for cosmetic products. The UD cruelty-free ethos really appealing to me and I respect their refusal to sell their products in China; requires all beauty products to be tested on animals before being sold. Before the event, I met up with a few of the lovely bloggers' gals for few a drink before heading up to the event for a catch-up, as we haven't seen each other since Christmas I can't believe how quickly times goes. 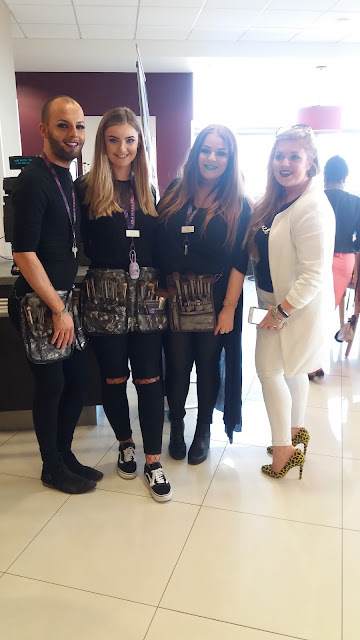 We headed off to Debenhams, were greeted by Laura and the Urban Decay make-up team. The team offered us all beavage something that resembles a purple witch, consists cider, lager, black current and vodka, it's lethal. While waiting for the event to proceed I was in awe of the city skyline. and couldn't resist a photograph. The UD makeup team introduced themselves. The enigmatic Micheal, who entertained us at the last event. It's great seeing how his confidence has grown, which was evident with his natural charisma ebbing through, with his deliverance of narrating the makeovers and his superlative product knowledge. The most unusual thing is how the new makeup range was inspired by the artist Jean Micheal Basquiat and how the makeup packaging utilises his artwork images that can be hung as art pieces once the make-up used, I love anything that's dual purpose. Micheal explained. about the history of the artist and he started drawing at the age of four years old and during his teenage years, he started selling hand painted postcards and t-shirts inspired by the post-punk movement and hip hop styles of New York. Basquiat first exhibited his work at 20 and soon rose to fame became associated with the likes of Andy Whorehole. and he even, briefly dated Madonna. At 28, died of heroin overdose. I have kind of became intrigued by the artists as it seems to have been reflected in the post-punk and alternative cultures of refusing to conform to the mainstream values of the time. Also, I've seen some of his work it reflects tribal influences, using dark imagery but with a warped sense of humour that speaks to be me. Anyways, the event started with three gorgeous models having a makeover using either an eyeshadow or contour pallettes. The first look was created by the Jean-Michel Basquiat- Tenant' eyeshadow palette. The UD makeup artist used the colour exu, medium green, and boom, a cobalt blue. I love these colours. Personally, I felt I use the colours so high up on the brow and would contrast with a much thicker eyeliner wing. hey, I love my eyeliner. It's great to see more diversity of bold and intense colours how easily accessible they are to purchase. The second look was created using the Jean Micheal Basquiat, Gold Griot eyeshadow palette. I love the use of the colours of Gemma's smokey eye. I like good black smokey eyes. Also, I've got more adventurous want to move away from safe neutral colours. The colours were gorgeous. The final model 'makeover utilised the Jean-Michel Basquiat Gallery blush palette to create a contoured look. I'm not really into contouring, It was interesting to see the finished look, and the model looked stunning. We were split into groups to allow us to take a closer look and try they samples of products. I think my favourites were the Jean-Michel Basquiat- Tenant' eyeshadow palette. 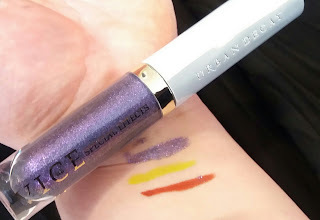 I was really impressed by the intensely pigmented eyeshadows. I adored the new Vice Special Effects, glitter gloss to apply over lippy to create the wow factor. approved lips, which is all gorgeous but my favourite was the purple glitter, when I swatched I was surprised at the intensity. I even got a few of the girls posing for shots, as I am trying to practice my photography skills. I caught Chloe, Chloex and Amy Anchored Teapot looking at the lipsticks. I caught Mimi, Mimi 04 World Macara, Macara's Space, Chloe and Laura, Elle Blond were chatting about the event. I was considering going to purchase the Jean-Michel Basquiat- Tenant' eyeshadow palette since I adored the colours, but I opted to splurge on the Urban Decay Full Spectrum Pallette. I had seen at the previous event. I was hoping Santa would have left one in my stocking, sadly, it never happened. This was an extravagant purchase for me, I rarely spend money like this on makeup, but I won't be purchasing any more eyeshadows for a long time, it means more fun with my eye makeup. I was feeling really happy to get UD Full spectrum palette. 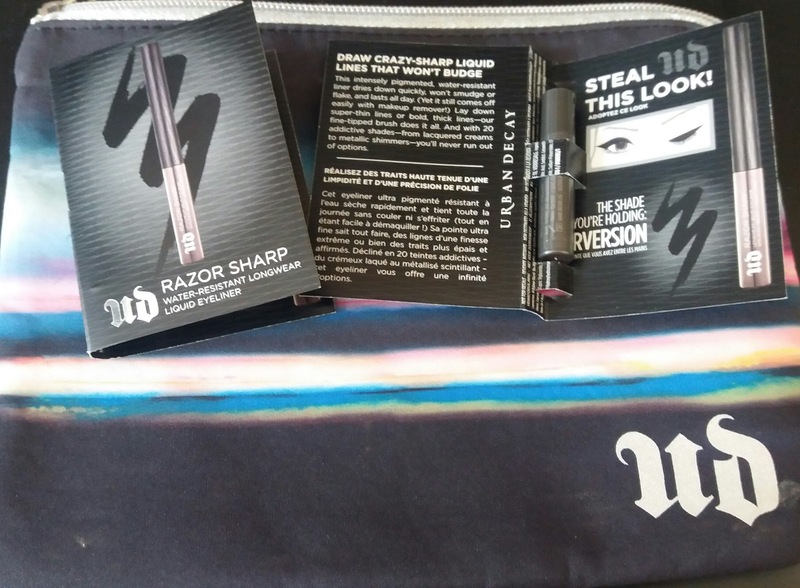 On plus the side, I got a couple samples of Urban Decay liquid eyeliner in Perversion (black) and new makeup bag for to test out. We said our farewells to the UD gang and to Laura, the rest of the bloggers went for a final cocktail, mine ended up a cuppa of tea since the purple witch went to my head. I enjoyed the night looking at the new UD makeup range, learning about Jean-Michel Basquiat, catching up with the blogger gals and finally getting the coveted Full Spectrum Pallette. If you're interested in the new range click on the link Urban Decay website. Disclaimer: I was not paid for this post. however, I wrote it in exchange for attending the event. 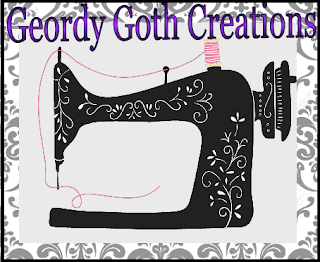 All is my honest opinions, and I like this brand. The full spectrum palette was purchased with my own money. It warms my heart to see more and more young men openly involved in cosmetics stores, either as salespeople or as shoppers. I think it's great seeing more men getting involved in the beauty industry. Micheal makeup looks incredible and knowledge is outstanding. I think heading for an 80's revival where men might start wearing makeup again. Everything seems to be reflecting that. Sounds like a lovely event (and lethal cocktails!). You look really cute and sometimes it's nice to buy something that's a bit of a treat. It was fun event and the cocktails were lethal, I think they mixed the blue wicked with vodka, that was why I was on the tea afterwards. I rarely purchase expensive items, so it was a treat sometimes it's nice to treat ourselves. Oh Wow!! I would have loved to go to this event!!! So much fun!! I never knew that about China! Very interesting! Now, I have to see what I can treat myself to in Canada, from Urban Decay!! Big Hugs! It was fun. Yeap, I like urban decay but some it's defiantly a treat.I was a fun event and nice to meet up with everyone again. Me too their so vivid but I prefer the full spectrum pallete since there is colours I'll use.